Your skeleton is more than a bunch of bones. Dr. Diane Schneider, a gerontologist specializing in the effects of aging on our bones, has crafted a wonderfully helpful and easy-to-use reference book – a comprehensive summary of the best research regarding osteoporosis, bone fractures and the medications that can assist in rebuilding bone mass. All six parts can stand alone or the reader can proceed from beginning to end. Regardless, the general layout of the narrative along with the generous use of bullet points, summary statements and anecdotal case histories makes it a go-to reference for the entire family. There are illustrations that provide clarification of medical terms. Dr. Schneider is able to convey critical information using a caring, but firm voice. Her colleagues and other researchers are well-represented and acknowledged. The many charts included in the treatment section list all the medications currently prescribed, calcium-rich foods, and study results related to bone density improvement and osteoporosis prevention. Exercises are noted with ample warnings to avoid fractures and breaks. Let’s hope there will be future updates to this very valuable resource. Highly recommended. A review copy was provided by the publisher. 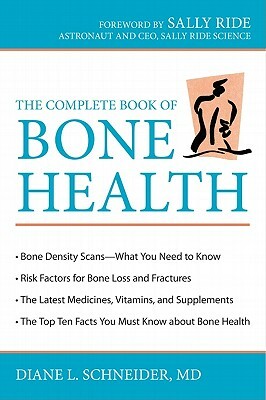 The Complete Book of Bone Health is available in hardbound and trade paperback versions, and as a Kindle Edition download. The foreword was written by astronaut Sally Ride. Lacey Yeager is herself an object of beauty and she is mesmerized by the notion of possessing beauty in the form of paintings. Her training at Sotheby’s auction house is the launching point for the morphing of a clever girl just out of college into a conniving woman years later. Her story is told by a college friend whose profession is closely aligned to Lacey’s. Daniel Franks is the narrator who allows himself to be drawn into her magnetic field for years. Crisp, dry prose that has the power to embed itself in the reader’s memory; exquisite examples of fine art illustrating the plot twists and turns; a white cover reminiscent of art gallery walls; and a journey through the inner workings of an impressionable mind make this book a sensational read. Never mind that this reviewer was a design major with an art history minor and volunteered as an art museum docent! A reader with lesser credentials will surely come away with the same sense of the personality quirks, self-absorption and greed that fueled the Manhattan art scene in the 1990s. Someone who does possess knowledge of art history can be assured that Steve Martin has gathered spot on examples for his illustrations. Martin has succeeded in avoiding the obvious, over-exposed works in favor of others by the artists being featured. Martin’s emphasis on the spare use of adjectives, ample use of specific details and well-researched facts place the story solidly in the time and places he has chosen. Lacey’s movements around Manhattan serve to define her values. She aspires to possess the best and has a great set of assets that provide her with what she wants. There is a bit of mystery that, while not particularly central to the novel, does serve to deepen the reader’s engagement with the story. Frequently at casual gatherings the question, “Who would you choose to sit with at a dinner party?” pops into the conversation. 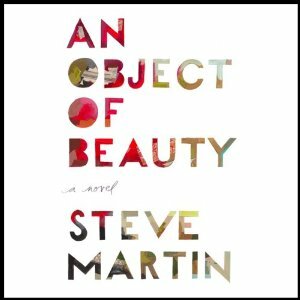 After reading An Object of Beauty, I know my immediate answer would be, “Steve Martin.” Although dinner party conversation would not allow me to plumb the depths of this brilliant man’s mind and character, it would be a wonderful start. Leaves tumble, Kitten mews. Porcupine snacks, Chipmunk chews. Hummingbird sips, Caterpillar munches. Rabbit nibbles, Squirrel crunches. Fish gulps, Bear licks. Deer grazes, Raccoon picks. Beaver chomps, Frog zaps. Skunk slurps, Turtle snaps. Supper waits, Fireside greets. Door opens, Kitten eats. This would make a perfect first reader for just about any child. 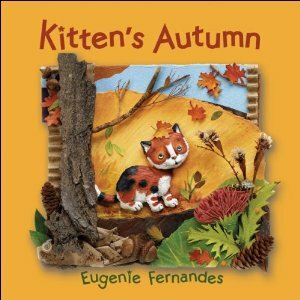 In Kitten’s Autumn, we accompany a Calico kitten on her very first trip through nature’s wonders during the season known as Autumn. She discovers other animals, both friendly and fearsome, all of whom are feasting on whatever it is they eat. This kitten observes them all before returning to her home for warmth and a good meal. Each double page is meant to illustrate a single sentence in a poem, and children will come to absorb the lesson that there’s a difference between being outside with nature and being inside one’s own home-sweet-home. The text and illustrations by Eugenie Fernandes (author of Kitten’s Spring) are both cute and charming. This one’s a winner, by all accounts – especially for curious cats and kids! This review was written by Joseph Arellano. Reprinted courtesy of Sacramento Book Review. This book is recommended for children between the ages of 4 and 8. This is a serious survey of the evolution of the ladies’ swimsuit in the 20th century. The text offers a chronology of the garments worn by bathers, accompanied by countless illustrations and photographs. Don’t let the fancy layout and gorgeous swimsuit models in the modern era suits fool you. There’s a strong correlation between the social and political achievements during the last century and the freedoms we now enjoy. Innovations in fabric production have allowed designers to create remarkably colorful and daring shapes that stand up to water and sunshine. In the past, there were several concepts that seemed like good ideas but failed miserably when put to use. The rubber suit was one of them. It seems that it was only good for a couple of swims before it crumbled – not exactly a pretty picture! Author Sarah Kennedy traces the various manufacturers and designers whose work stands out and has survived the whims of fashion. She has brought together resources from England and the United States. There is a comprehensive list of designers and manufacturers as well. 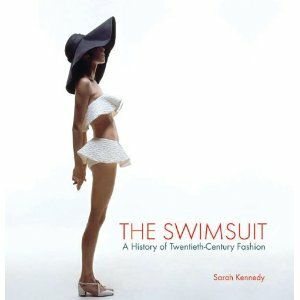 This book would make an excellent present for the swimsuit fashionista on your holiday gift list. Reviewed by Ruta Arellano. Reprinted courtesy of Sacramento Book Review. Take Away: Women will enjoy reviewing this clever look at the female liberation movement, from an on-the-beach perspective. But don’t be surprised if the males in the household (ages 15 to 80) are caught using it for scientific research purposes! Readers who are familiar with Ginger the cat will be happy that Charlotte Voake’s latest book is the perfect – or purr-fect – companion to Ginger. They are the same size with very similar covers, which makes them a lovely set. The cast of characters has expanded with the introduction of the mystery visitor. The storyline involves a cat who sneaks into Ginger’s house to eat. The tale is short and sweet with a built-in message or two. It offers opportunities for the reader and listener to discuss what can happen when we feed other people’s pets. The illustrations are charming and full of expression. Clearly, this is a book to be read aloud to young children. Later, it will be a good one for practicing reading skills. Lastly, a grandma or grandpa who is creating a library for the grandchildren can count on Ginger and the Mystery Visitor as a welcome addition. 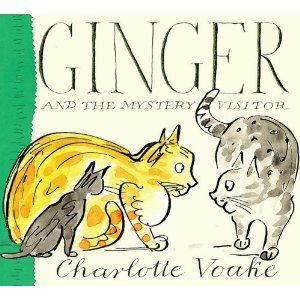 If we’re lucky, Charlotte Voake will create more books about Ginger. Highly recommended. This review was written by Ruta Arellano. Reprinted courtesy of Sacramento Book Review. People sometimes wonder what it is we cats do all night long. Well, this neat-o book by Lisa Westberg Peters (illustrated by Jennifer Taylor) shows that we keep the household going, doing lots of essential stuff while the lazy humans are asleep. We chase mice, clean counters, empty trash cans, water the yard and call meetings of the Neighborhood Watch Patrol. Yes, we work while you sleep and if not for cats like Frankie, who knows what a mess you’d wake up to in the morning! This is just a great 32-page book that introduces the young kids to us felines and helps them to learn how to count. OK, so the adults in the household may not appreciate the so-called “ruckus” they claim we make when it’s dark but – as my favorite band the Eagles sing – get over it! 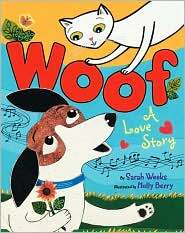 The illustrations are beautiful and do justice to us handsome cats and even the stupid dogs. The end of the story finds Frankie sleeping after taking care of business all night. Let sleeping cats lie is what I say. Oh, and give them plenty of Purina Party Mix Treats. You’d better add this one to the family library. This review was written by Munchy Arellano, the brown tabby cat. A review copy was received from the publisher. Munchy has received no compensation for his endorsement of Purina Party Mix Cat Treats. 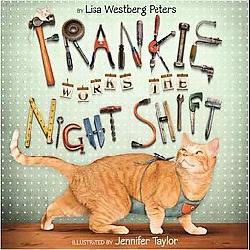 Frankie Works the Night Shift is recommended for children between the ages of 3 and 8.